Jennifer Slegg from the SEM Post identified this week that Google has added an additional alert for website owners with sites that are not mobile-friendly. Google was already adding alerts in Search Console and is now showing a warning when you conduct a ‘vanity search’ for your site’s name. Slegg uses an old site of hers as an example. The warning only shows in mobile searches. The result also only shows when you are logged into the Google account that is connected to the Search Console for the website. 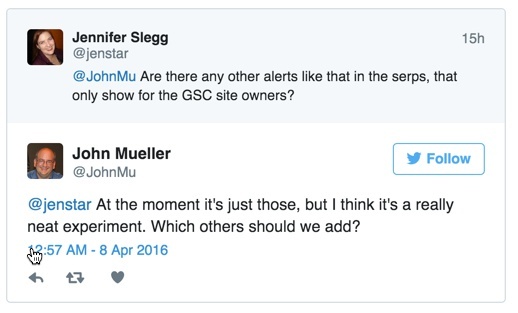 John Mueller, Google’s webmaster trends analyst, has also confirmed Google is only showing the alerts for sites that are not mobile-friendly. In doing so, Mueller opens up the idea of other alerts being pushed out this way. It all really comes down to one thing for website owners. You can’t say you haven’t been warned! Following the initial ’Mobilegeddon’ roll-out in April 2015, Google recently warned further tightening up would start in May 2016. And there have been plenty of other articles like this highlighting the importance of adopting a mobile-friendly strategy. If you are ignoring the signs, you are doing so at your own peril.